Most products qualify for Zero Rate VAT Relief which will be shown at checkout if applicable. Please read the VAT Declaration below. 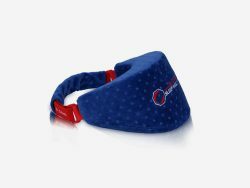 We have introduced this Dr Dakota Neck Cushion primarily for CPAP and Non-invasive Ventilator users to help keep the chin supported to encourage nasal breathing and prevent the chin falling out of the bottom of the mask. It is a good alternative to chin straps, which don't suit everyone as in some people they can cause the jaw to fall backwards, thus making the apnoeas worse. This should also help many snorers, but please note we never encourage people to treat their snoring without also investigating to see if the cause of snoring is sleep apnoea, which is dangerous if untreated! 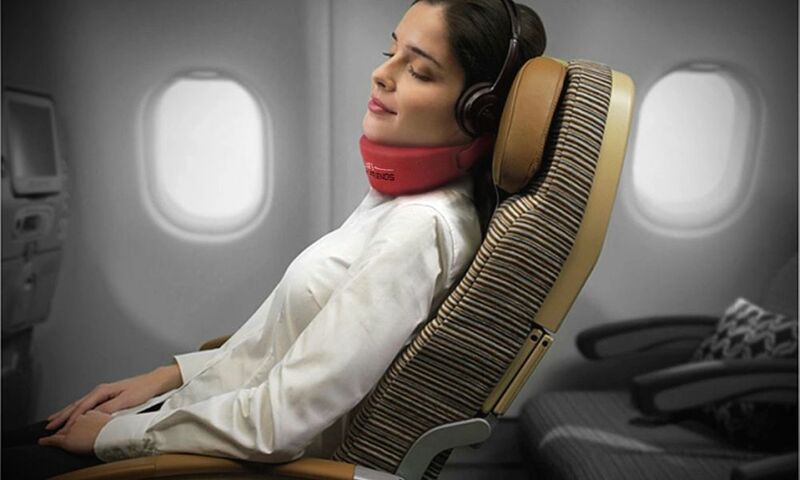 This Neck Cushion/Chin Support by Dr Dakota is unique in that, unlike most neck cushions/collars it only has the bulk of the cushion at the front, ensuring it is more comfortable when lying down. 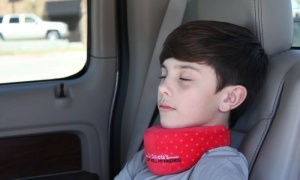 The back has a comfortable adjustable thin strip to secure the neck cushion in place. 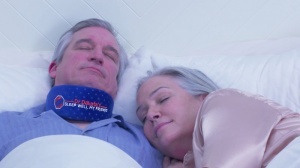 We at the charity have been trialling it (like we do with all of our products before releasing them) and one of our trustees has a serious neck injury, but she found it caused no more discomfort that she already lives with, and if anything it offered her extra support by preventing her neck falling forwards during sleep. Encourages nasal breathing, which is healthier when possible. Helps prevent dry mouth, for which one of the causes is mouth breathing, which as well as causing discomfort, can result in tooth decay. 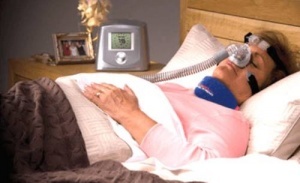 For nasal mask users it helps prevent the mouth opening, which can result in a loss of pressure from the CPAP and also cause interrupted sleep. For full face mask users it helps prevent the jaw dropping which can cause mask leaks. 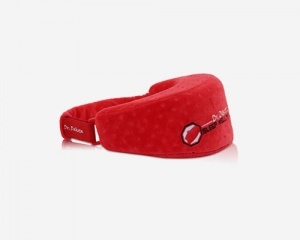 This Dr Dakota neck cushion has an added benefit for travelling, and whilst it does not claim to stop the apnoeas, it may help minimise them at times when it's not practical or possible to use CPAP, such as on short flights or car journeys etc. 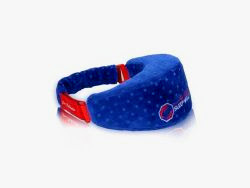 It could quite well stop or minimise the snoring, and prevent a stiff neck. Made of Memory Foam, with washable, anti-microbial, mite resistent, patented Jacquard Velvet covering. The large size appears to be the most common and is supplied in blue only. It is designed for those who have a length of 5 inches or more from the bottom of the neck to the chin. 2 side straps are included. The regular size comes in either blue or red and is more suitable for children and adults with a shorter than 5 inch measurement from the bottom of the neck to the chin. 2 side straps are included. The following video is presented by Jason, a world reknowned USA Sleep Tech showing the positive benefits of this product. However, before watching, please bear in mind that the Dr Dakota Neck Cushion does NOT claim this product will cure sleep apnoea, and has responsibly re-vamped the new packaging boxes which in future will say "Snoring & CPAP Accessory." There is also a full page on their website warning about sleep apnoea. Good for dry mouth using cpap machine. Did nothing for my apnea. Good to hear that it's helped with your dry mouth, which is what is hoped will happen for many people by keeping the chin supported. 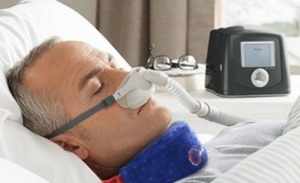 The cushion is not advertised to treat apnoeas, although in some cases it has been proven to help, but never a replacement for CPAP. Not sure about this product. Got my new chin support I think this will take a bit of time to get used to. It’s not as comfortable as I thought it would be. It does help with keeping the mouth closed and find it best not to tighten too much. Along with having a full face mask I feel very restrictive. I think this chin support will take a little while to get used to. I also feel this product is too expensive for what it does. I also ordered the large size (adult) but found this to be much to big so now have the smaller size. The Dr Dakota neck cushion is very comfortable and does as described. Very effective at supporting chin which in turn keeps mouth closed. Got some great help from the team @Hope2Sleep when picking out this chin support. 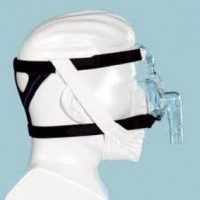 I have used many types of chin straps to compensate for mouth exhalation while using my CPAP. Like anything worthwhile, it took a few days to settle with it, but its working a treat so far. Onward and upwards thanks to new tech. This cushion works really well. It is comfortable to wear from the first time. I thinks it is more effective and more comfortable than the expensive chin straps . 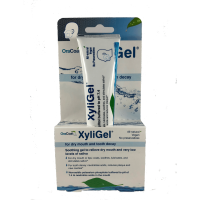 It helped to improved the quality of my sleep as well as helping to prevent a very dry mouth. I read the reviews positive and negative and decided to take the plunge. So I measured myself for the size I needed and placed the order. Excellent service from Hope2Sleep as they kept me informed when the delivery would be made. Have only worn it once due to it being too big (ordered large according to sizing guide) and I find it doesn’t work for side sleepers with a full mask. As with other reviews the fastening is very fiddly and could be improved. It did not help with my dry mouth and I just gain a stiff neck. Just be aware by the time you have paid the £28 + VAT and postage it comes to nearly £40 a lot of money for item in its box under the bed. Such a shame as when the cushion works for people they find they can sleep on their side with it, as long as the size is right. If the neck cushion doesn't do the job it's supposed to do it won't help with dry mouth. This would only be improved. Please do contact us for advice as it's imperative to get the dry mouth issue sorted. Works for me! Has stopped me getting a dry throat. The Velcro securing is a bit fiddly. I use the Dr Dakota cushion instead of a chin strap and it works well. No more dry mouth and it is comfortable. It also has an added benefit it seems. I wear a F&P full face mask and with the Dr Dakota I can now put my head fully on my pillow on either side without the mask being disturbed/leaking. Before I had to put my head on the edge of the pillow, but it seems that the Dr Dakota helps support it. I am using a reasonably firm latex pillow. A good combination! I purchased this cushion to see if it would be better for me than a chin strap which is causing a lot of facial marking . It is an extremely well made piece of equipment very soft fabric, concealed zip and extreme care in its making and I so hoped it would work, but sadly not for me unfortunately. I just could not get comfortable with it . I have numerous health issues and have an inflammatory arthritis which despite lots of medication gives me pain all over everyday especially neck and shoulders. I am certain this neck cushion will be suitable for lots of people just not me this time. However I’ve still given it 4 stars as I feel it’s a well made product . Thanks for taking the time to give your honest feedback Margaret, even though it wasn't the solution for you personally. Soft, comfortable, yet solid support to keep one's chin from dropping when sleeping, so that we don't breathe through our mouths (my problem!). Also prevents SNORING! Magical! We try our best to ship all orders received by us Monday-Friday on the same working day if received before 12 noon, and more often than not orders processed before 3 pm will be despatched the same day whenever possible. Weekend or UK bank holiday orders are sent out the next working day. An automated email is sent when products have been despatched so please check your spam box and add us to your safe senders list. Also, if you do not receive an email confirmation, please check that you have typed the correct email address in your account. All orders are sent via 1st class mail within the UK. Masks and some other more expensive products are always sent via 'signed for' insured delivery and cannot be left in 'safe' places, but there is the option for an alternative shipping address when processing the orders. International orders are sent via tracked Airmail, and whilst we're happy to ship internationally, we cannot be held responsible for any charges that may be added in your own country. Delivery charges are worked out automatically by weight and you can clearly see the delivery charges before purchase. On the rare occasion delivery charges are miscalculated by the website, a refund will be sent, as it is not our policy to make money on postage charges and neither do we add the cost of delivery into the price and offer so-called 'free delivery' like some sites and Ebay pressurise sellers to do! Wherever possible with larger parcels, we try to re-use boxes to keep shipping costs down and protect the environment. If a product is out of stock and the order contains multiple items, the 'in stock' items will be sent immediately and further items will follow upon arrival with no further postage charges incurred. Masks and most products cannot be exchanged, unless faulty, due to health and hygiene issues, in accordance with the Consumer Contracts Regulations, (as stated in our 'Terms and Conditions' ) and where you will find our return address, so if you are unsure about any product please contact us BEFORE purchase or BEFORE opening a sealed packet. Unopened (sealed) products in their original packing can be returned within 14 days for a refund of the product cost, but the purchaser is to pay the return postage, and we would advise retaining proof of postage. This excludes any faulty goods, for which postage will be reimbursed. A full refund for the price of the product will be issued when received by us, less the original postage charges when the order was sent to you. 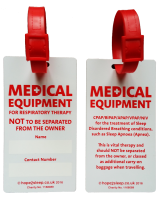 You or the person you are purchasing on behalf of have "a condition which the medical profession treats as a chronic sickness," (sleep apnoea and sleep disordered breathing, which require therapy, are such conditions). "The goods or services are for the personal or domestic use of the customer." We cannot advise on individual cases, but more information can be found on HMRC’s website under notice 701/7 on the following link https://www.gov.uk/government/publications/vat-notice-7017-vat-reliefs-for-disabled-people. If you are purchasing on behalf of someone else who meets the above criteria, you must provide their name and address, and you will be prompted of this during the checkout process. Customers living outside of Europe do not pay UK VAT charges, so please leave the the 'zero rate eligibility' box ticked. However, we cannot be held responsible for any additional costs incurred when the products reach your own country. If you are purchasing with the intention of re-selling any products, you are liable to pay VAT on all products so you must untick the 'zero rate eligibility' box which will add VAT to your order. Any products that our not eligible for zero rate VAT, will not display the VAT Declaration, and VAT will be added at checkout. © 2019 Hope2Sleep - a Registered Charity No.1168089 run by Sleep Apnoea Sufferers, CPAP & Ventilation Users and Sleep Professionals.